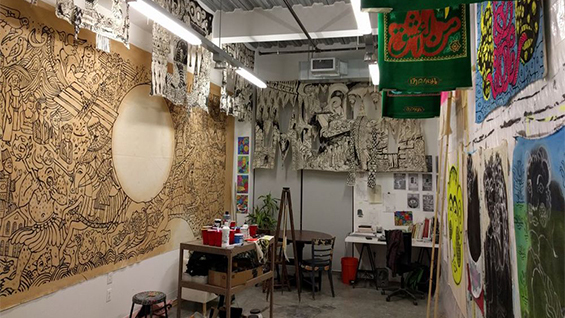 Two-Headed Imagomancy is a lecture-storytelling form from Shahrzad Changalvaee and Iman Raad that reveals Perso-Arabic writing systems, language formations, and mythological structures. By exposing their role in colonial confrontations and the conditions of globalization, THI addresses technology, architecture, and art as tools to empower authorities. THI has been presented in different venues in the US and abroad. It responds organically to its audiences, the space, politics, practice of the collaborator artists, and the image of future, at the time of each presentation. Shahrzad Changalvaee's practice responds to sculpture in a vast field of media, including installation, video, photography, text, and performance. She constructs unities of prints and multiple elements in a non-hierarchical rhizomatic connection system. Her recent photographs of accumulation of studio tools and material manifest resistance to organizational structures and patriarchal grid. Changalvaee was featured in Shanghai Biennial (2012), was the artist in residence in the Delfina Foundation in London (2012), and currently is a member and co-director of Bon-Gah collective in Tehran. She received a B.A. in Graphic Design from Faculty of Fine Arts, Tehran University (2006) and her M.F.A. in Sculpture from Yale University (2015). of five hundred designs that matter as representative of the contemporary Persian graphic design movement. He received his M.F.A. in Painting and Printmaking from Yale University (2017), and is the 2017-2018 Shandaken Projects’ Paint School fellow. The Spring 2018 IDS Lecture Series at The Cooper Union is organized by Leslie Hewitt and Omar Berrada. The IDS Public Lecture Series is part of the Robert Lehman Visiting Artist Program at The Cooper Union. We are grateful for major funding and support from the Robert Lehman Foundation for the series. The IDS Public Lecture Series is also made possible by the New York State Council on the Arts with the support of Governor Andrew M. Cuomo and the New York State Legislature.